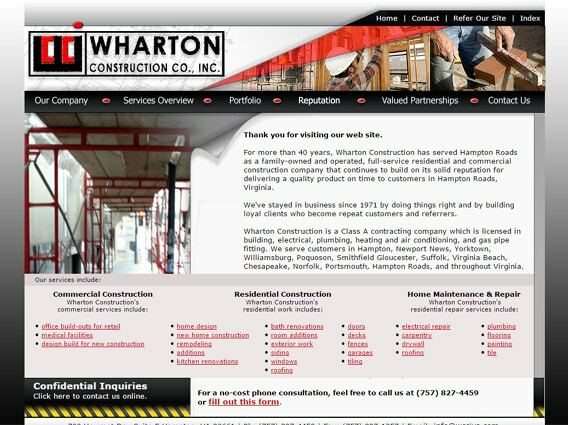 Web design services Hampton VA | VISIONEFX designed a custom website for Wharton Construction that was easy to use and generate new business leads for the business. Since 2010 the website continues to provide a powerful online presence for Wharton. Wharton Construction has served Hampton Roads as a family-owned and operated, full-service residential and commercial construction company that continues to build on its solid reputation for delivering a quality product on time to customers in Hampton Roads. VISIONEFX serves business owners in Hampton VA. We provide extraordinary web design for small and large businesses throughout the United States to include; custom web design, web development, e-commerce web design, Word Press web design, Joomla web development, SEO and web maintenance services. Call: (757) 619-6456 or email info@visionefx.net.